" Bed bug facts including information on identification, bites, and treatment methods. Bed bug infestations are considered to be the toughest to treat among all insects. If you have a bed bug problem, the first step should be to call in an exterminator or take a sample to a cooperative extension for confirmation. Then follow the steps outlined below." Bed bugs (C. lectularius) start in an egg and then pass through 5 infant life stages (called instars) followed by the 6th stage which is when a bed bug becomes an adult. A baby bed bug is referred to as a nymph. As they move through each life stage they shed their skin. A blood meal is needed to move from stage to stage. Bedbug eggs are pear shaped and white. They can be seen with the naked eye, although a magnifying glass and flashlight help as eggs are about the size of a poppy seed. They adhere to the surface with a cement like substance. After hatching a nymph is about the size of the head of a pin. Nymphs are straw colored with all bed bugs changing in appearance as they move through the life cycle. Adult bedbugs are 1/8 - 3/16 inches (4-5mm) long and are red/brown in color. They body is oval shaped. The parasites feed on people, but will also feed on warm blooded animals. Pets includes cats, dogs and birds. They will also feed on rodents. The insects have vestigial wings (non functioning) and cannot fly or leap onto a host. They most at about the speed of an ant over ceilings, floors and other surfaces. They will travel up to 100 feet in search of a host. A female bed bugs can lay up to 300 - 500 eggs in her lifetime, and look look for a secluded area. She will lay 3 to 5 per day. A bed bug can move through its life cycle in as little as a month (typically 4 to 5 weeks), depending on temperature. The ideal temperature is 70F to 90F for bed bug development. Typically, they will move through 3 generations in a year. Bed bugs can survive for slightly longer than a year without feeding, with nymphs (baby bed bugs) surviving for up to 3 months. They will feed at night and hide during the day unless disturbed or under stress. 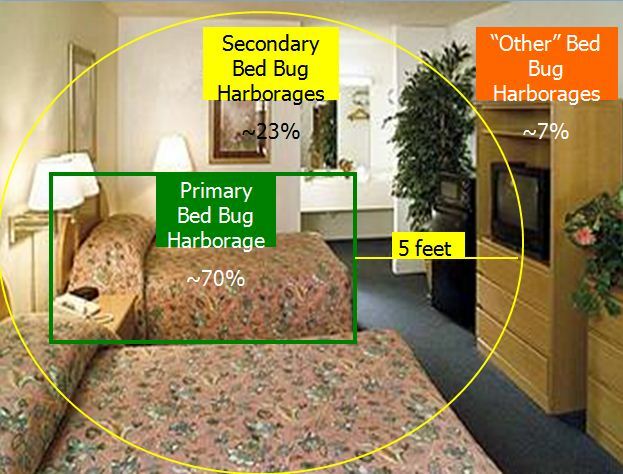 Bed bug infestations spread when bedbugs are carried from one place to another. They hitch a ride on luggage, used furniture and the bags of returning college students. Where ever there are people, there can be bed bugs. In New York City they have been found in clothing stores and subways. Across the country they are turning up in college dormitories and hospitals. It has little to do with socio-economic status, but more likely correlated with travel. Studies show that bed bugs can spread from apartment to apartment. There is a 7% chance that they will spread to an apartment over or below the infested room, and a 20% chance that they will spread to an adjacent apartment. A bedbug doesn't actually bite, but punctures the skin through a hollow tube called a stylet. They pierce the skin looking for a vein or capillary to feed on. They will feed for 3 to 10 minutes and then return to their hiding place until ready for the next meal. People do not feel the bed bug bite or can tell when a bed bug is feeding on the skin. Bed bugs can carry disease pathogens (up to 20 human diseases), but do not spread disease. Recent studies of bed bugs in hospitals show that patients that were bitten in the hospital have a higher incidence of the MRSA skin infection. Most people show no skin reaction to the bed bug bite. Those that do have a reaction can see one within an hour to as long as 14 days later. 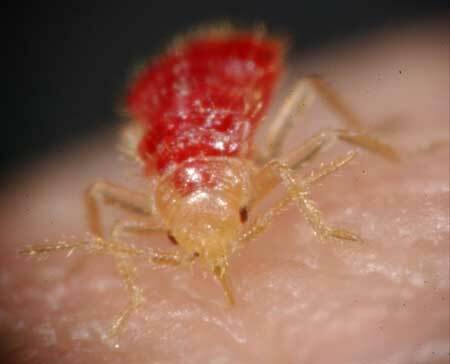 Mild bed bug bites range from a single red papule to groups on papules. Bed bugs primarily bite areas that are exposed during sleep. They will also bite under loose fitting clothing. Unlike other insect bites that have a red center, bed bug bites have a clear center. Bed bug facts: Bites are an allergic reaction that is different from person to person. 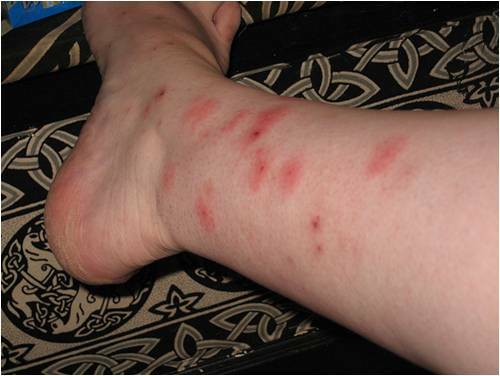 Bites can be individual or found in groups on areas of skin that are accessible to the insects when the host is asleep. Bedbugs hide in tight spaces about the width of a credit card. They leave marks such as brown/black feces, skins and stains. Eggshells from hatched bed bugs and the eggs themselves are also signs of a bed bug infestation. They do sometimes leave a raspberry type odor, but it is not always present. Dogs are able to be trained to sniff out bed bugs at all times, an approach which is 98% accurate. First confirm that your building has bed bug infestations by bringing a sample to a local cooperative extension or ask the building to show a sample to an exterminator. Baby cockroaches and other insects look like bedbugs, so look for other signs such as mattress stains to confirm that you have a bed bug problem. If you live in a home, then call an exterminator at the first sign of trouble. We suggest starting with the Service Magic Network (1.877.277.1145) as they pre-screen members, and check to make sure members are licensed and insured. They will provide up to 4 free quotes. Compare quotes to firms you find in our bed bug exterminator database. Bed bug treatment can cost from $50 several hundred dollars for the in-home inspection and over $1,000 for the treatment itself. Because of the high cost, it pays to get several quotes. Also, companies vary in levels of experience, written guarantee, time period the guarantee covers and bed bug solutions used. To save money, you can purchase a bed bug kit. 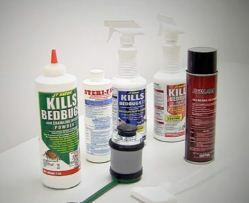 A kit is essential as multiple products are needed for a complete bed bug solution. These include bed bug sprays, powders/dust and a hand steamer. Organic bed bug kits and insecticide based bed bug kits contain the bed bug products needed. Dispose of clutter, this minimizes the number of hiding places. This includes newspapers, toys, magazines etc. Wash all bedding in hot water. Dry clean any items that can't be washed. Use the vacuum crevice tool and vacuum the mattress, box spring, floors, head board and along the baseboard. Be sure to vacuum inside the box spring. Steam the mattress and box spring with a hand held steamer. Steam clean carpets as well. Larger bed bug infestations may require removal and possibly disposal of the carpet. Treat all items with sprays starting with the knock down spray, followed by the residual spray. Cover the mattress and box spring. See this page on bed bugs treatment for detailed instructions. If a bed bug infestation is in the bedroom, studies show that most insects will be hiding as close to the host and bed (70%) as possible. A study by the University of Kentucky found 35% of the insects in the box spring, followed by the mattress (22%), frame/headboard (13%), nightstand/dresser. Bed bug hiding spots outside of the bed room are places where people congregate in the home such as couches, sofas and reclining chairs. Bed bug facts: About 7% of bed bugs in a typical home or apartment are found in the walls and ceilings. Be sure to check sleeping areas, around electrical outlets, underneath lamps, and in and under drawers. No professional can find and treat every bed bug. It will take several treatments and a combination of products to do the job. For example, one bed bug spray is needed to kill bedbugs and eggs on contact to reduce or knock down the size of the bed bug infestation, while another spray is needed for lasting protection. Bed bug facts: In apartments, bed bug problems often return when tenants fail to allow multiple treatments, leave clutter that blocks treatment, or picks up bed bugs and brings them home. Bed bug facts: Several strains of bed bugs are showing resistance to some insecticides. Even DDT, a now banned and once effective insecticide will no longer work against today's bed bugs in most North Eastern cities. Note that Phantom is not available to New York residents. Both Sterifab and Bedlam are mattress safe. A good organic spray alternative to these insecticide baaed products is Bug Patrol. Other tools for bed bug removal include the vacuum (crevice tool is helpful), and a hand steamer. A steamer generates the 113F necessary to kill the insects. Multiple steam treatments can significantly reduce the size of bed bug infestations. Professionals have tools not available to homeowners such as fumigation, portable heaters (called thermal remediation), and freezing sprays (carbon dioxide spray). They are also licensed and trained to handle pesticides. Are Bed Bug Encasements Necessary? It is very easy to miss bedbug eggs and the insects themselves during treatment. The eggs are often glued to the foam padding inside the box spring. If a mattress and box spring is in good condition, if is preferable to use a mattress and box spring cover instead of throwing out the mattress/box spring set. This is used after treatment to trap any bed bugs and late hatching bed bugs that might have been missed during treatment. Encasements must specifically state that they are bed bug proof. 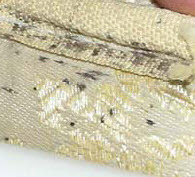 If they are not, it is likely that bed bugs can escape through the zipper. Bed bug facts: Pillows should be thrown out. They can also be protected in bed bug pillow covers. Note that encasements do not keep bed bugs off of the person sleeping, they only keep the bed bugs from hiding in the mattress/box spring. If you do not have bed bugs, but want to protect the mattress, then encasements will provide the needed protection.